This recipe for Hungarian baked dessert noodles is known as rakott teszta (RAH-koht TAYSS-taw), which means (layered dough) or rakott metelt (RAH-koht MEH-tel-it), which means layered noodles. A creamy combination of cottage cheese, sour cream, eggs, sugar and raisins are combined with melted butter and cooked egg noodles, and then baked until set in this dessert that also can be served for breakfast or brunch. It can be made ahead and reheated with no loss in quality and it holds up well in a steam-table pan on a buffet line. 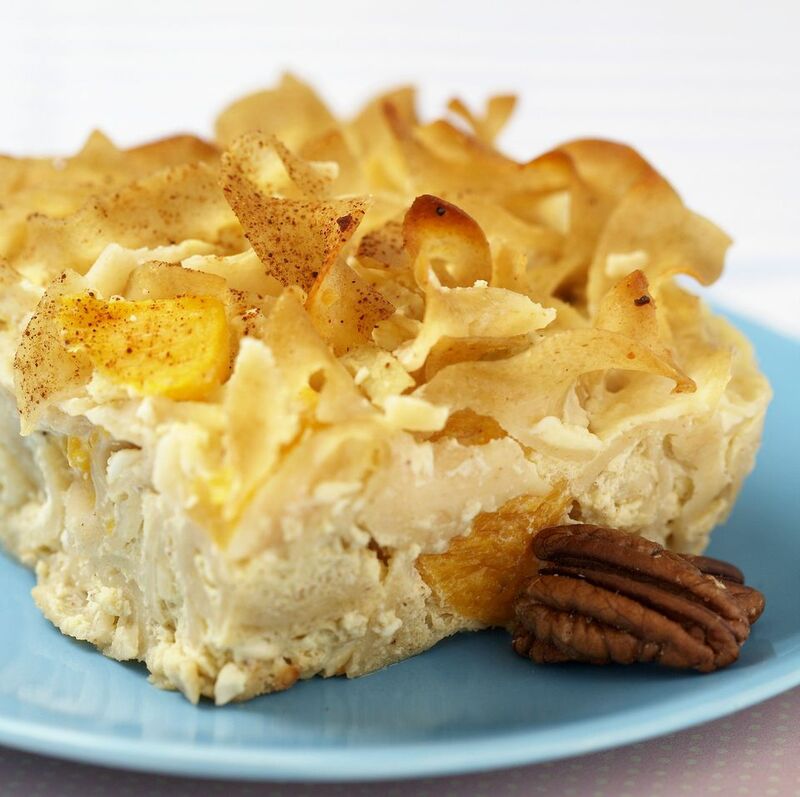 The dish is similar to Jewish noodle kugel and can be made in many ways. This is my favorite version. If you're committed to making this totally from scratch, including the noodles, see how Hungarian noodles are made. And here is a basic Hungarian egg noodle recipe. Heat oven to 350 degrees. Lightly coat a 13x9-inch pan with cooking spray. Combine 4 ounces melted butter, 2 cups undrained creamy cottage cheese, 2 cups sour cream, 4 large eggs and 1/2 cup sugar in a blender or food processor and purée until smooth. In a large bowl, mix 1 pound cooked wide egg noodles with cottage cheese mixture and 1/2 cup white raisins until well combined. Transfer to prepared pan. Cover with aluminum foil and bake 30 minutes. Remove foil and sprinkle with 1/2 cup sliced almonds. Bake an additional 15 to 30 minutes or until a knife inserted into center comes out clean. Remove from oven. Cut into squares and serve, sprinkled with confectioners' sugar, while still hot. This may also be eaten at room temperature. Cérnametélt: Extra-fine noodles, literally thread noodles. Copfocska: Twisted tails or pig tail noodles. Csiga: Snail or shell-shaped noodles made on special csiga boards. Csuszedli: Broad noodles or long, wide noodles. Fodros Nagykocka: Frilly, large square noodles. Kaposztás: Large square noodles, literally "cabbage" because of its use with sautéed cabbage. Orsó: Spiral noodles similar to Italian rotini. Szarvacska: Little horn noodles similar to elbow macaroni (also the name for little twisted noodles). Tarhonya: Tarhonya is a hand-grated noodle also known as egg barley. Here is a recipe for Browned Egg Barley or Piritott Tarhonya.